We all now live in a paranoid and polarized world of Putin's making, and the Russian leader, through guile and disruption, has resurrected Russia's status as a force to be reckoned with. From renowned foreign policy expert Angela Stent comes a must-read dissection of present-day Russian motives on the global stage. How did Russia manage to emerge resurgent on the world stage and play a weak hand so effectively? Is it because Putin is a brilliant strategist? Or has Russia stepped into a vacuum created by the West's distraction with its own domestic problems and US ambivalence about whether it still wants to act as a superpower? 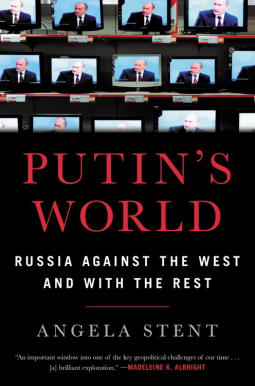 PUTIN'S WORLD examines the country's turbulent past, how it has influenced Putin, the Russians' understanding of their position on the global stage and their future ambitions -- and their conviction that the West has tried to deny them a seat at the table of great powers since the USSR collapsed. This book looks at Russia's key relationships -- its downward spiral with the United States, Europe, and NATO; its ties to China, Japan, the Middle East; and with its neighbors, particularly the fraught relationship with Ukraine. PUTIN'S WORLD will help Americans understand how and why the post-Cold War era has given way to a new, more dangerous world, one in which Russia poses a challenge to the United States in every corner of the globe -- and one in which Russia has become a toxic and divisive subject in US politics.